It’s heartening, then, to see that a project aiming to create new green spaces is now bearing fruit. This month, the Mayor of London announced the successful delivery of 100 pocket parks across the capital. Pocket parks are small areas of public space with trees and greenery, places to sit and relax and spaces for people to socialise. They also contribute to making the city friendlier, greener and more resilient, and have been instrumental in contributing to public health in low income areas. London’s first pocket park provided a blueprint for making small-scale green infrastructure interventions a reality across the capital. The park was created beside the bus stop on Landor Road, Stockwell, by a team of ‘guerrilla gardeners’ working with the local community. This once forgotten space has now been transformed into a thriving garden and neighbourhood hub. 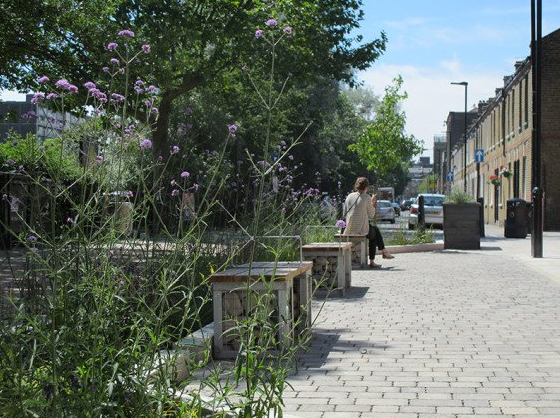 This project transformed a dead-end road that attracted anti-social behaviour and fly-tipping into a safe and vibrant community space, incorporating a rain garden, seating areas, a cycle lane and permeable paving. The current plot of this project, near Canning Town station, is due to be reclaimed by a developer, leaving the community without a permanent space. In response the Pocket Parks team has embraced the idea of moveable growing spaces. The resulting ‘mobile parks’ will provide areas that have limited park access with gardening space and activities. Residents of Hackney’s Trelawney estate generated many of the ideas that has resulted in this new pocket park, including a space for local people to meet and improved wildlife habitats. The planting scheme acknowledges the site as the location of what was in the 19th century the largest hothouse in the world, with an unrivalled collection of palms, orchids and ferns, which helped influence planting in the rest of the UK. The pocket parks approach is not confined to the UK capital. There are good examples elsewhere in the country and overseas. In Newcastle-upon-Tyne, the city council and business development company NE1 have been working together on pocket parks. One original idea is Quayside Seaside. Complete with deck chairs, palm trees and buckets and spades, creates a space where the visitors can unwind, build sandcastles and enjoy a free game of volleyball. Originally opened in the summer of 2011, the installation has proved to be so popular that it has become an annual fixture in Newcastle’s calendar of events. Further afield, pocket parks are providing residents and visitors with oases inside the concrete jungle. The growth of pocket parks shouldn’t obscure the need to look after our larger public parks. As the Heritage Lottery Fund report observed, “they are deeply rooted in the physical fabric, spirit and identity of thousands of places across the UK”. Pocket parks should be seen as complementing rather than competing with these bigger green spaces, in helping to make the pressures of urban life a little less stressful for us all. Enjoy this article? Read our recent blog on Designing new wildlife-friendly housing developments. We’ve made some of our member briefings freely available. View a selection of our environment publications on our website.